You have been committed to a run down mental health facility against your will. In order to prove that you are fit to rejoin society and earn your freedom, you must achieve the goal your psychiatrist has set for you – your aspiration. The catch? You need to achieve your goal as quickly as possible, while keeping 7 other patients, who you don’t know and are out of your control, alive and as happy as possible. Add to that budget cutbacks leading to a lack of decent furniture and limited supplies, and your task gets harder. Create your main Sim and their 7 fellow prisoners in CAS,they can look however you wish but must all have the Insane trait. You can choose the personality for the sim you will control, but must randomly assign traits to the other 7 adults. You can have no more than 5 ‘bed spots’. For example, you could have 5 single beds, or 2 doubles and a single. There can only be total seating for 6. That includes couches, lounges and chairs. If you have a dining table with 4 chairs then you may not use a couch that seats 3. You may have only 1 piece of napable furniture (excluding beds), so if you have a couch then you may not have a recliner and vice versa. Only 1 toilet, 1 sink and 1 tub. For the tub you can have a tub or a shower or a tub/shower combo. You cannot have both a tub and a shower unless it is a combo. You may only have a total of 5 Skill Building items in the house, so choose wisely at the start. Computers, stoves, bookcases, mirrors, and TVs don’t count as skill items, but pools and ponds do. If you want a TV, you must purchase the cheapest one; but no other electronics/entertainment are allowed – no mp3 player, no handheld games, no video games, no pool table, etc. If you choose to get a TV, you cannot have a computer. You may have a computer, but only one. It must be on a desk with a chair so that it is accessible to any of the patients. You can use this for the writing skill. If you choose to get a computer, you cannot have a TV. You can have as many phones as you want. But due to the shoddiness of the asylum, no burglar alarm, no smoke detector and no sprinklers. You must have the cheapest stove. You cannot have more than one. You can only have one fridge. Once you are finished building and furnishing the house, you must reduce your funds to $100. 1) YOU HAVE NO CONTROL OVER THE OTHER 7 SIMS. Even clicking on their icons is prohibited, you can never see any of their needs or wants under any circumstances. Also you may not ask them any questions or on a date, take them off the lot or get them jobs. They are heavily medicated patients and unlike you, they don’t have day passes. 2) You may only leave the Asylum to work. 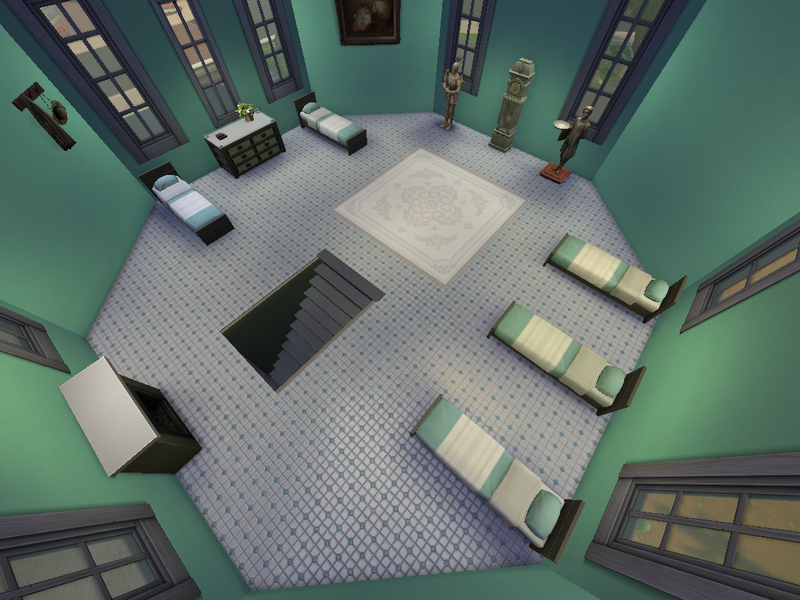 You may have other sims visit. You can even date other sims as long as you don’t leave the lot. 3) No maid, no gardener, no repair person, no exterminator. You can not have a baby or move anyone else into the lot even if someone else dies. 4) If anyone dies (other patients or visitors) you must leave their tombstone on the lot and allow the ghost to roam freely. And congrats, you now have a haunted asylum. And if a patient dies, you must delete 1 bed and 1 seat per death. Once you achieve your Aspiration you calculate your score, beginning at 100 points.